Although we felt a little rushed at times, I still enjoyed the food here. Before making the decision to eat at Fat Noodle, there are a few things that you need to consider. It’s loud, rushed and situated right in the middle of The Star Casino gaming level. If this kind of atmosphere is not what you like, then this is not the place to go. Personally I don’t mind loud and rushed, and for me - being in the centre of it all was all part of this dining experience. 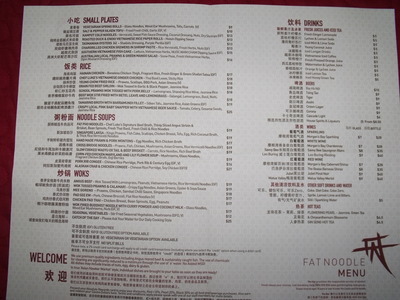 I had heard a lot about Fat Noodle prior to going, and was looking forward to tasting the dishes they had. The seating area is quite open. It has an open view to the kitchen as well as the gaming area. There is an amazing piece of art work on the wall. It is red in colour, and has all the symbols of the Chinese Horoscopes. The colours travel from the Casino into the restaurant - giving it a continuous flow. Being an early lunch, we did not have to wait at all for a seat. I would imagine on the weekend you could find yourself waiting, however in saying that things seem to move quite fast here. We were asked if we preferred a dining table for three, or a high communal table. If you prefer the privacy of your own company - you should choose the standard dining tables. We opted for the communal dining. We wanted the whole experience. 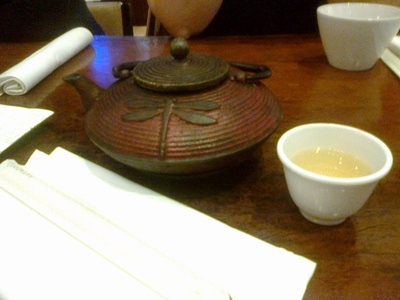 We were quickly ushered to our table, and before we had even sat down - another waiter came over with a pot of Jasmine tea. The menu was already on the table, and our waitress stood beside us waiting to take our order. We were not quite ready, and she asked if we wanted to hear the specials: which we did. Not wanting anything from the specials list, we asked for a few minutes to look over the menu. The menu had several selections from small plates which included the Salt and Pepper Silken Tofu ($10), Tasmanian Oysters ($13 for 4) and Kampot Cold Noodles ($13). They also had rice dishes ranging from $17-$25. Noodle soups and Woks. The drinks list consisted of fresh juices, soft drinks and iced teas ($5 each). There was also a range of beers and wines to choose from. We started with the Spring Rolls ($9). Put simply, the spring rolls were delicious. Filled with glass noodles, pork, carrot, tofu and wood ear mushrooms, along with the fish dipping sauce - we could not have made a better choice. Except of course for the choice we should have made. 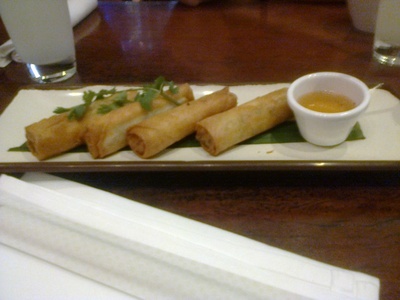 There were three of us, and we ordered one plate of spring rolls, and that right there was our mistake. The plate had four spring rolls. We each dipped our spring roll into the fish sauce and bit into the most crispy, crunchy, piping hot spring rolls we had ever eaten. There was ample filling inside, and steam coming out of the top. Therefore, we all knew we wanted another one. There was only one left. We all stared at the last one. We all wanted it, though none of us wanted to look like the greedy one. We kept conversing, and at the same time - we each had our eye on that last spring roll, fearing that if we looked away for one moment it would be gone. I am sure you have all been in this position before. Secretly we all wanted it. After a few minutes we knew what had to be done. We ordered another plate. If there are more than two of you dining at Fat Noodle and you all choose the spring rolls; make sure you order more than one plate. Trust me, there won’t even be a single crumb left over. I could have happily eaten a plate of spring rolls and nothing else. That is how nice they were. Although there were a number of choices I could have made for my next meal, I am the type of person who will go for what I know. I go for ingredients that are familiar to me. My choice was Mee Goreng ($18). The serving was quite large and good value for its price. It was overflowing with prawns, chicken, Singapore noodles and sambal chilli sauce. The menu didn't mention the vegetables or egg that also came in the meal. Mine was overpowered by the sambal chilli sauce. I like a hint of chilli, however this was far too much for my liking. The chilli overpowered the other flavours. This is not to say that the meal wasn’t nice, there was just too much sauce. Depending on your taste, I would suggest if ordering this meal - is to make sure the waiter knows how you like it. One of the friends I was with ordered the Chicken Pad Thai. A combination of chicken breast pieces and bean sprouts, mixed with egg and sprinkled with a generous serving of peanuts. We were told this was a very popular meal often purchased by customers. 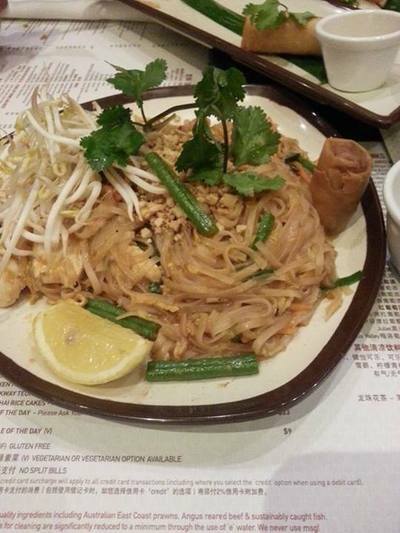 The bean sprouts were fresh. The chicken was tender, and the peanuts were quite crunchy. She found her meal to be quite nice. Overall, it was a nice lunch at a nice place with great company. It is not the kind of place that you could sit around and chat long after your meal was over. It feels somewhat of a production line. Once you are done, your seat is needed for the next group. In that sense, we felt a little pressured to leave once we had finished eating.The spring rolls were by far the draw card for me. If you are at the Casino and feeling hungry, this is certainly worth trying. However, I personally would not make a special trip into the city to eat there. Why: Atmosphere and value for money. Cost: Small plates $9-$16, rice $17-$25, noodle soups $19-$21, woks $19-$25. When: Sun-Thurs 11.30am-2am Fri-Sat 11.30am - 6am. Good for kids: No, must be over 18. Is it ok to have a crush on your child's teacher? Great evaluation. I must try the spring rolls and soon. You made my mouth water.